Fridge Magnets is something that exists in every household and they come in all shapes, sizes and designs. Although there are so many variations available, I wanted to create my own fridge magnets to make something that fits into my kitchen color scheme en theme. So this is what I came up with. I basically created three different kinds of fridge magnets: Pebble, blackboard and memorabilia magnets. If you don’t have modge podge available you can use this recipe to make your own at home. Basically you just mix white craft glue and water to a 2:1 ratio. Trace the pebble shape using a pencil onto your paper and cut along the lines using a scissor. 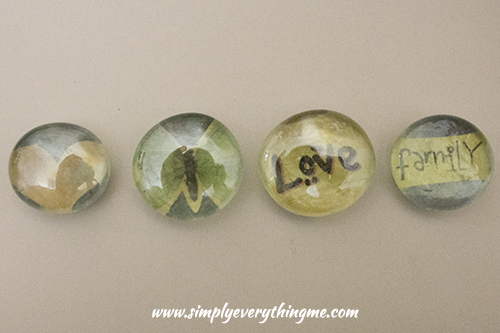 Do this for each and every one of your pebbles that you wish to turn into fridge magnets. Don’t forget to keep the different pebbles together with their associated cutouts. Using a small brush, first cover the back of your pebble (the flat side) with modge podge. Stick the image face down onto the pebble and apply another layer of modge podge on top of the paper. Leave to dry completely. If there are a bit of the paper sticking out of the sides of the pebble, use a scissor to carefully cut it of. Apply another 3 to 4 coats of modge podge, leaving to dry completely in between layers. This ensures that the paper is sealed and glued down properly onto the pebble’s flat side. In the last image you can see that I was using sheet magnet for my pebbles – this is where you DON’T USE SHEET MAGNET but rather round craft magnets. For each pebble, apply craft glue to your magnet and stick onto the pebble. Leave to dry. Six simple steps to create your own pebble magnets. Easy peasy. Measure the size of the peg and mark out on the white (non-magnetic) side of your sheet magnet using a pencil. Using a ruler together with a craft knife cut out the magnet piece (which the size of the peg). You can also use a scissor to cut your sheet magnet. Glue the white side to the peg using white craft glue. And there you have it. 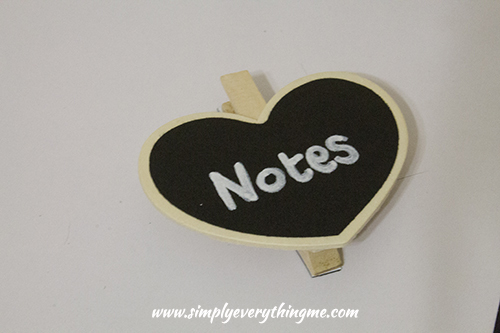 A mini chalk board peg magnet which is great to stick on your fridge and hold notes, to do lists, love notes or photos. To write on my black board, I tend to use a white paint marker since I don’t want to be able to change the wording and it doesn’t smudge like chalk. It still gives the lookalike effect of chalk. This is entirely up to you; you can use chalk, chalk markers or paint markers. 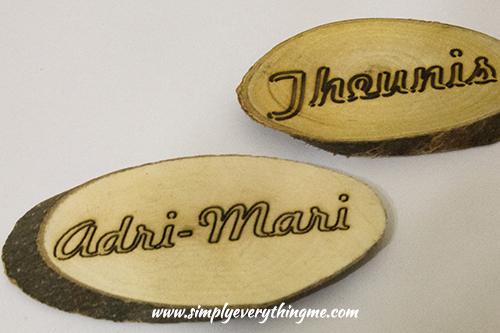 Using hardboard ask a handy helper (in my case my husband or if you are really DIY savvy just yourself) to cut it in your desired shape using a bandsaw or jigsaw. Once you have your shape, sand the edges using sanding paper until they are quite smooth. 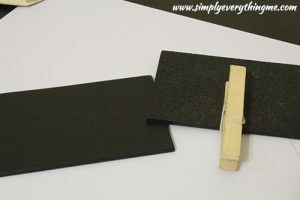 Use white craft glue/wood glue to glue your peg in place on the back of your now mini chalkboard. Small memorabilia items (I just don’t know what else to call it). Anything that you like, that is quite small and lightweight which you can imagine putting on your fridge. I used name tags we received at a wedding that were too pretty to throw away and I couldn’t think of anything else to do with it. Trace the item shape using a pencil onto the white (non-magnetic) side of your sheet magnet and cut along the lines using a scissor. If the edges are straight, you can cut the sheet magnet using a ruler and craft knife. 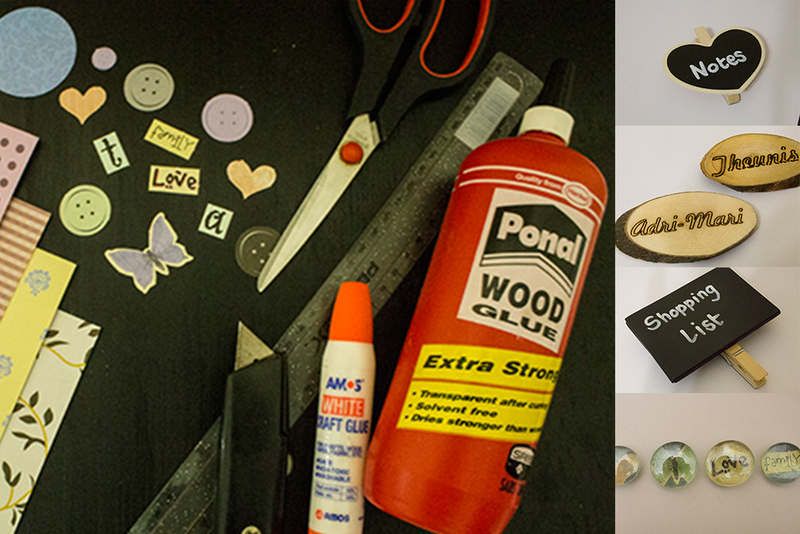 Using the craft glue, stick the white (non-magnetic) side onto your item. Do you have any other great ideas on DIY fridge magnets or have you tried this, let me know on Twitter #SEMcrafts and tag me on Instagram or Facebook when you give something like this a try.